Let me just start this post out by saying that this was a bigger pain in the arse than I expected. To counter the negativity, though, it was totally worth it. 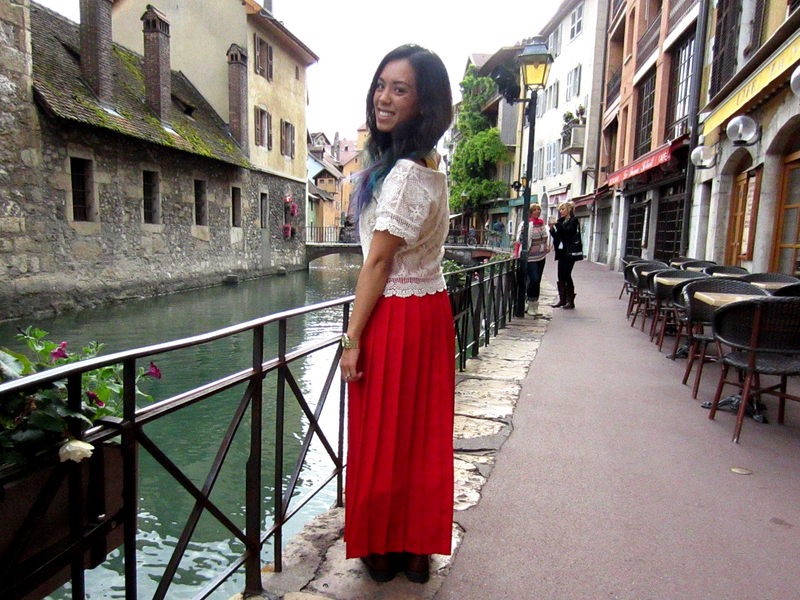 With that off my chest, I found an accordion skirt that was the perfect length for me, but 10 sizes too big. 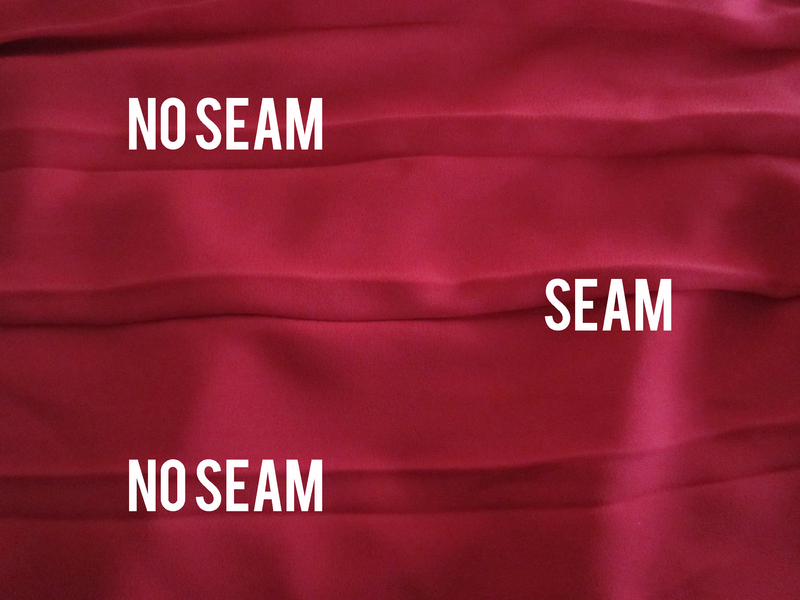 Sewing a seam into a normal skirt? No problem. 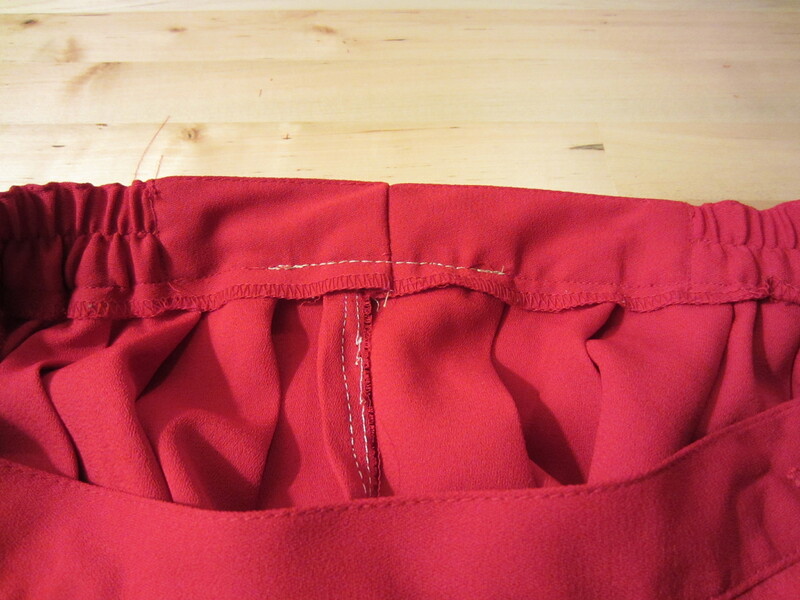 Sewing a seam into an accordion so that it blends in perfectly with the permanent folds? Ugh. I checked where the existing seams lay, and they’re hidden within the fold. 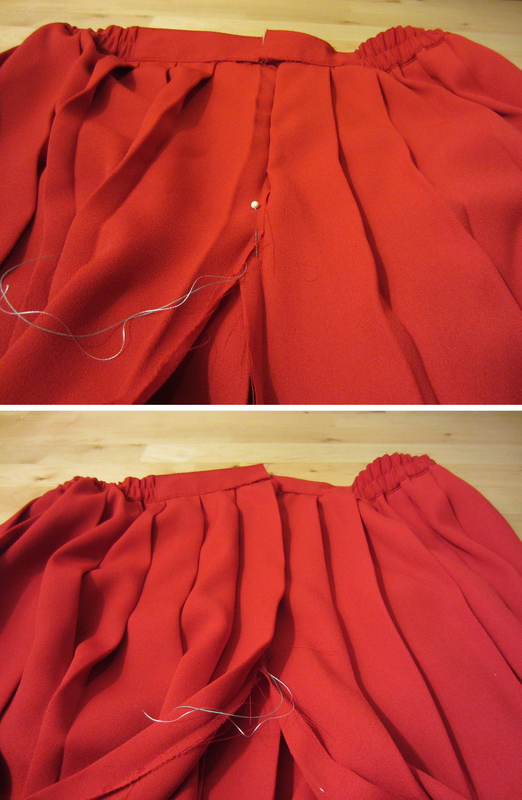 I cut out enough material so that the skirt would fit and attempted to put it back together. I had to undo the band too. 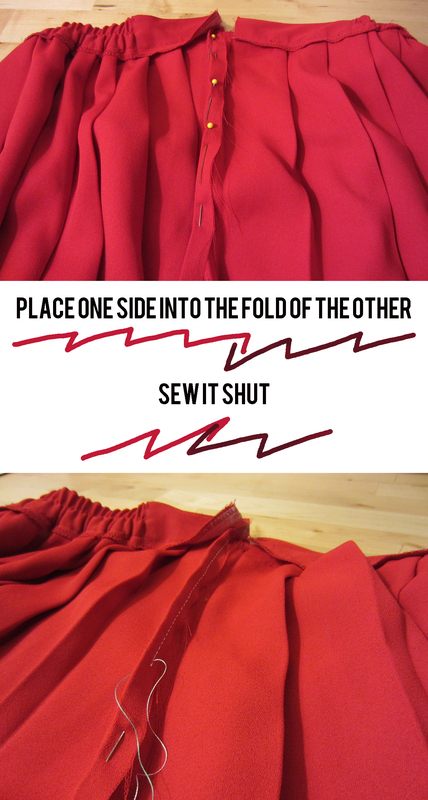 To make sure the seam is hidden in the fold, you have to sandwich one side into the fold of the other. The front should look like this (not sewn all the way). Sew the band back on. I like how neither I or these ladies decided to back down on being in each other’s photographs. BONUS! You did a great job. It looks beautiful. omg! this is adorable! You are so good at this! I recently purchased the most adorable 1950’s dress. It is about 3 sizes too big and I need to alter the size obviously. Are you in L.A? I would totally love for you to fix my dress. I would ship it to you if needed…lol. All I’m sayin’ is I dig your skills. high five to you! 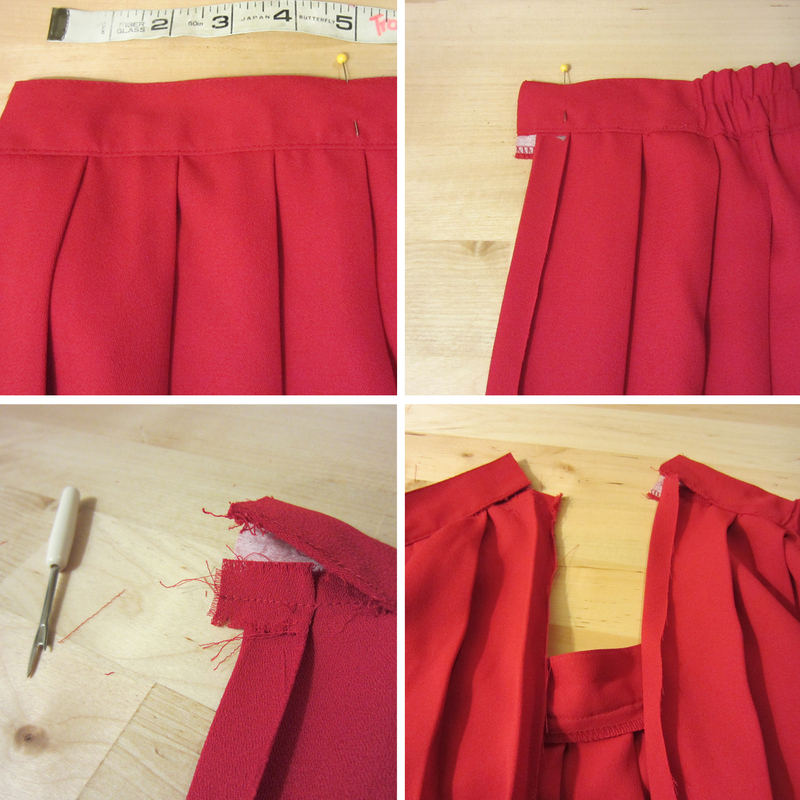 I was wondering…would I rather alter a pleated skirt that fit everywhere but in length OR do what you did here? What would you rather do? 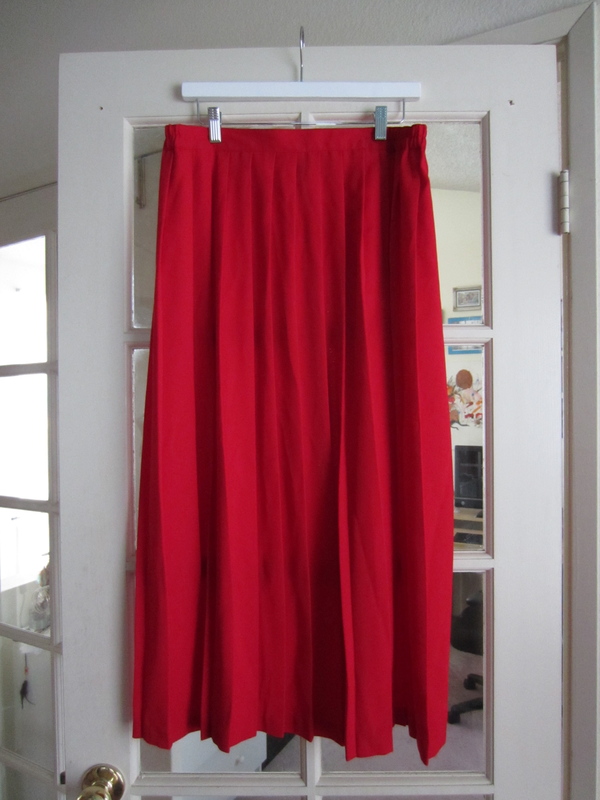 If I had a skirt that I knew fit perfectly in the waist, I’m thinking that I would baste a line across the pleats to hold them in form, take off the waist band, trim the top of the pleating just above the basted line and then stitch the waist band back on. Was it hard to tell if the skirt was going to fit well and and that the pleats would lay well before you stitched it back together? (I do realize it was an A-line skirt.) Either way, I’m so grateful for your fabulous documentation. You have a great website. Well in all honesty I think that taking in a pleated skirt at the waist vs altering the length is comparing apples to oranges since they’re two completely different dimensions. If I had to choose, however, I suppose I would go with shortening it rather than reducing the width, as you mentioned in your comment. Basting it is a great idea in order to keep the pleats intact – in fact, I did that with another skirt that I didn’t blog about and it was really easy.